What is Computer Crime ? Any crime involving a computer or a network is referred to as Computer Crime - harmful act committed from or against a computer(cyber crime) or network(net crime). Practically there is no reliable data on the amount of computer crime and the physical/economic loss to victims, mainly because many of these crimes in the digital work of 1 and 0 remain undetected. Why is it dangerous than terrestrial crime ? 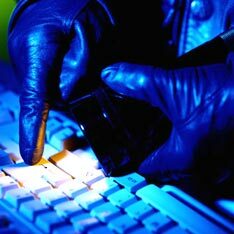 Estimates are that computer crime costs victims in the USA at least US$ 5×10,00,00,000 / year. A DOS attack occurs when an Internet server is flooded with a continuous stream of bogus/irrelative requests for web pages which may or may not exist, thereby denying legitimate users an opportunity to view or download a page and also possibly crashing the web server. Eg : The Yahoo website was attacked on 7 Feb 2000 morning which lasted three hours. During this attack of DOS Yahoo was pinged at the rate of one gigabyte/second. • Network interference - impeding or preventing the access of others.The most common example is a DOS attack. Computer or electronic evidence is inherently complex and volatile in its own unique way. Electronic evidence is complex because it can be derived from any computing resource, at any level of operation machine language to meta-data and beyond. The evidence can be latent, not visible or active. It is also volatile, because it can be digitally altered or easily destroyed, often without detection. Some evidence may even be time sensitive.As with any other type of evidence, electronic evidence becomes useless when it is mishandled or improperly managed.